Charlotte, Get Ready For A One Of A Kind Sonic And Visual Experience With Papadosio Reviewed by Kris Engelhart on November 6, 2018 . There are some bands whose music defies basic descriptions or explanations. Their music can not be categorized with a simple word or phrase and it is best experienced live where each individual listener can absorb it and surround themselves with the unique experience of a musical journey. Papadosio is one of those bands. They have a sound that is uniquely Papadosio, a blend that escapes genre, bringing the worlds of rock, progressive, psychedelic, jazz, and electronic together for a sonic delight. Some have described it as space rock or have called them a jam band but truly nothing can quite describe their sound fully. In fact, when I asked keyboardist and vocalist Sam Brouse to describe Papadosio’s sound for someone who was new to the band, he had a difficult time, instead turning the tables and asking me what I thought. Although their sound may be difficult to define, it is easy to listen to, enveloping the audience in layers of auditory sensations with complex progressive rock structures and technical rhythms highlighted with fabulous melodies. Originally hailing from the Athens, Ohio area, Papadosio now resides in the arts and music hub of Asheville, North Carolina. The band has been together for over a decade and has garnered a huge, dedicated fan base with their mesmerizing live shows and relentless touring schedule. Over the years, the band has refused to remain stagnant and continued to push their musical boundaries. Their latest offering Content Coma is a testament to their creativity, showing their growth not only as technical musicians but as experienced songwriters. The new album which was released this past September addresses one of the most important issues of our time and one which could have far reaching and long lasting effects on humanity; our seemingly endless addiction to the internet and social media. What exactly does this mean for the human race and where will this technology take us? Has it made our lives better, more convenient? Or has it made us virtual slaves to our smart phones? 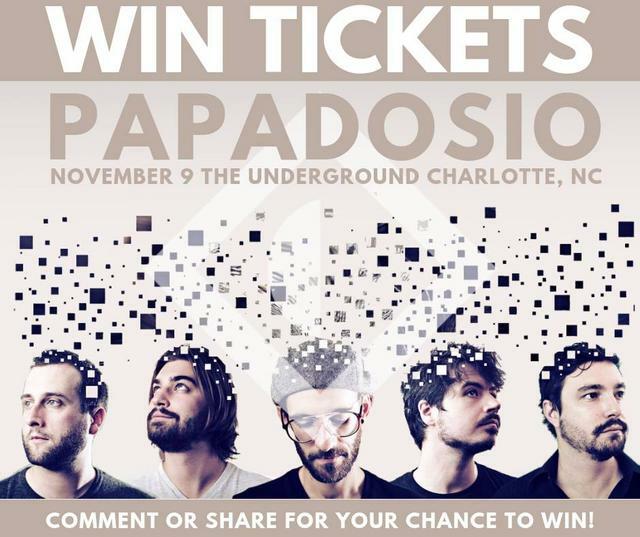 Those questions and more will be pondered in a live musical setting as Papadosio makes a tour stop right here in Charlotte on Friday, November 9th at The Underground. Last day to enter the ticket giveaway! The band is well known for their enthralling live performances, each one a distinct encounter like no other. Papadosio will let the evening take them where it may with brilliant musicianship and improvisational skills that will make any jam band fan stand up and take notice. Unlike some modern bands, Papadosio are true musicians that play actual instruments. You won’t find them on the stage simply pushing buttons and turning on electronics. Along with the auditory sensations, fans will be treated to an out of this world visual show. The visuals are an important aspect of Papadosio’s live shows and the band members work hand in hand with visual artists to ensure that the visual experience is a perfect complement to the music. Shutter 16 had the opportunity to chat with Sam Brouse, keyboards and vocals,and get all the latest information on the new album and tour. You can listen in on our conversation below. So what are you waiting for? Don’t miss your chance to check out the ultimate musical experience when Papadosio brings the Content Coma to a city near you. One lucky Shutter 16 reader will win tickets to see the Charlotte show. Click on the links below to find out how.